I have been a loyal Trillian fan for a few years now. I enjoyed all the features it gave me, like tabbed messaging and the ability to log conversations. I've tried other instant messaging clients before and haven't been thoroughly impressed. Sure, some have customizable themes and other neat bells and whistles, but most are pretty much the same. So what can newcomer Digsby bring to the table? 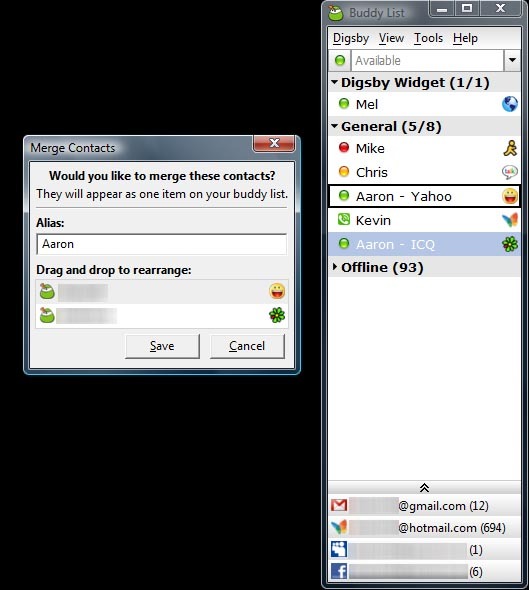 Created by dotSyntax, Digsby is a multiprotocol instant messaging application. It was written in wxPython and uses the open source framework WebKit for all of its rendering. As of March 20, Digsby is no longer a closed beta. When I heard this news I decided to give Digsby a review. Digsby has a mile long feature list on their website. There are some that stand out above the average instant messaging application. Synchronization: Everything from the skin you chose to your pre-defined status messages follows you from place to place. Tabs: You can drag tabs out into their own windows for important conversations. Social Network Integration: Receive alerts of events such as new friend requests, messages, group invites, etc. Consolidation: If a friend has more than one IM account you can combine them into a single merged contact to eliminate duplicate buddies.